First of all I am new to this whole circuit building thing so please don't be too harsh on me. I recently tried to build my first adder with NAND gates. So I went to a shop and bought some CD74HCT03E devices. 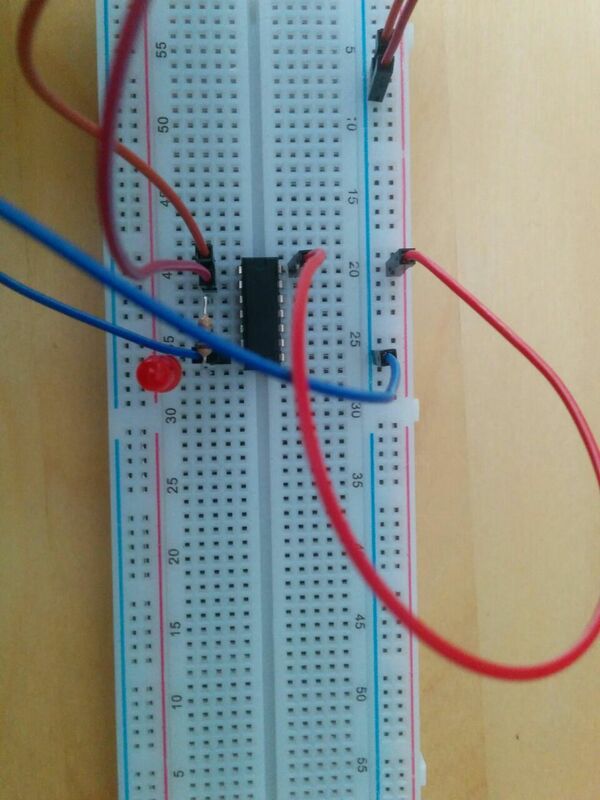 To get started I just tried out the NAND gate but it didn't work. I had a really really basic setup: a NAND gate, the power supply, and a LED. 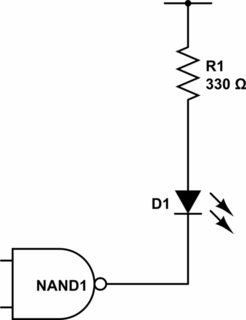 I already verified this circuit with my physics teacher and he sad that everything is fine. I also checked every pin with my voltmeter. Every input (A/B grounded) were at 0V and the output (Y) flicker but were also at 0V. 74HCT03 is open drain output. That means it can only pull the output low. You got really unlucky on your first purchase, the NAND gate you purchased only drives low, it never drives high. It is an open-drain output. You will need to add a pull-up resistor on 1Y to VCC. You can also connect the LED directly to 1Y and move your ballast resistor as the pull-up to Vcc. Try this circuit. It's how it should be connected. Open Drain (collector) have their applications, but it may be best to stay away from them when experimenting. Each output will require a "pull-up" to work. One application is paralleling gates to a "wired OR" (or "wired AND") in this case. Otherwise a third gate is required. 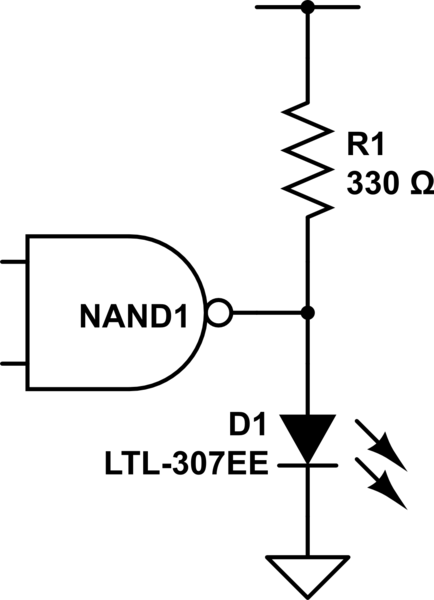 In the following circuit, activate either NAND to turn on LED. Not the answer you're looking for? Browse other questions tagged breadboard nand or ask your own question. 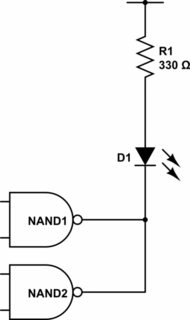 Is my jk flip flop missing two NAND gates to be complete?